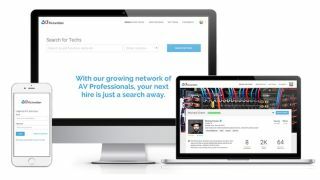 AV Junction is set to arrive at InfoComm 2018 with a total membership of freelancers and hiring companies that exceeds 1,000. What’s more, according to AV Junction founder Paul Weatherhead, the company has completed its first major project in the Middle East and will unveil a software licensing platform in Booth C4024 at the show. Weatherhead reported that 60 percent of its freelancer members come from the U.S., with an additional 15 percent each from Canada and the United Kingdom. Hiring company membership closely follows at 50 percent from the U.S., 10 percent from Canada, and 20 percent from the United Kingdom. According to Weatherhead, AV Junction is taking its next step forward at InfoComm 2018 with the launch of a new software licensing program designed to be white labeled by the world’s largest systems integration firms. “It’s designed for the top 20 percent of systems integration firms who have told us that they have a network of freelancers, but they really need a robust management platform that is really well thought out from the perspective of both the hiring company and the freelance professional." "They love our platform and our new licensing program is going to enable them to better manage their existing network and to tap into our membership of freelancers as their needs dictate. We’re really excited about how our business model is evolving and gaining traction in the market,” Weatherhead concluded.